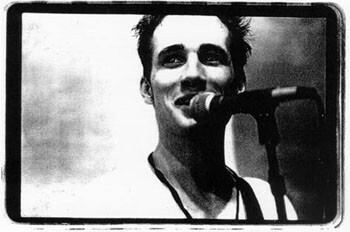 A few weeks ago I posted a fantastic recording of Jeff Buckley singing Bob Dylan's "I Shall Be Released" over the phone for WMFU radio, with the help of some friends. One of those friends of Jeff's was Michelle Kinney, who sang and played the accordion in the studio that day. Through a series of events, we've been corresponding by email - and she's let me know of a great new project she's working to develop, using a cleaned-up version of that arresting and blissful recording. Michelle writes, "Being in Jeff's company whether he was singing or not was transcendent (most of the time). You could feel him coming from blocks away." Her husband was also a friend of Jeff's, and played guitar on that recording of "I Shall Be Released" (as well as backing Jeff at the St. Ann's tribute for Tim Buckley in 1991). Michelle has developed an artist's record label called Sugarfoot Music which has received permission from Jeff's estate to officially release that incredible recording on a compilation CD benefitting a musicians' village in New Orleans. Jeff's song will join 30 other artists on this album to help raise funds to build homes for musicians displaced by the hurricanes in 2005. 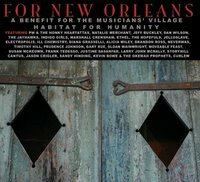 The idea of a Musicians' Village was conceived by Harry Connick Jr. & Branford Marsalis, and will house musicians and families whose lives were devastated by Hurricanes Katrina and Rita. With the support of others, including a $1.5 million challenge grant by musician Dave Matthews, Habitat for Humanity has already begun rebuilding a neighborhood of music players and music lovers. Among the contributors: Dan Wilson (of Semisonic), Natalie Merchant, Indigo Girls, Marshall Crenshaw, Gary Louris & The Jayhawks, and more. 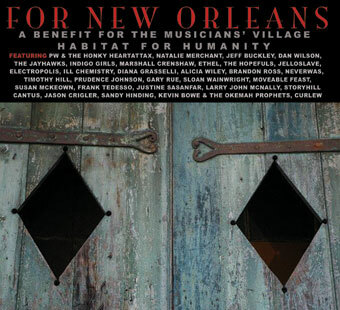 Sugarfoot Music’s benefit CD includes a 36-page booklet featuring a photo and a thought on New Orleans from each artist; I love liner notes that possess thought and depth -- it's like getting a great book along with the CD and adds so much to the experience. In thinking back to the day that the song with Jeff was recorded, Michelle remembers; "We were all goofing around in a very low-key kind of way, and Jeff was so far from being a star. Aside from the pure joy of playing with Jeff over the phone, no one knew that this would become a special thing. On the CD, we edited out most of the other remarks -- the preference of the show's producer, Nick Hill. It's mostly just the song, with Jeff's comments at the end." When Jeff lets out an ebullient laugh and thanks everyone as the song ends, what sticks with me (and always makes me break into a huge smile) is the refreshed elation in his voice, the untarnished joy of being involved in such a beautiful singalong. It will be great to have this version in my collection, and to support a worthy cause. You can order the CD on the Sugarfoot Music website. In the short time I've had that amazing song in my collection, it's become my absolute favorite cover that Jeff ever recorded, and is a fitting and affirming addition to the theme of this album. And as Michelle says, "I know that Jeff would have been down there hammering nails himself." Buy the cleaned-up/non radio-rip version for a good cause here. this is an all-around great story but really shows just how incredible a human being jeff buckley was, that nearly 10 years after his death his memory still benefits people in intangible and now tangible ways. Someone once called him the most famous unfamous musician of all time.